Are you ready for a genuine fresh cup of coffee at work? Munch a Bunch Vending in Carlsbad can make that happen. We are the leading vending machine, office coffee and water filtration supplier in the San Diego area. Don't let the lack of food and drink at your Carlsbad location cost you valuable productivity. When your employees have to leave on break to get coffee, cold beverages or snacks they don't get to rest or relax and they may even be late coming back to their shifts. Our Carlsbad service eliminates these problems by bringing those items right to your building. 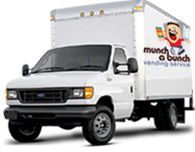 Munch a Bunch Vending is a full service vending provider in Carlsbad, offering a host of name brand vending products for you to choose from. Some vending companies fill the machines when you aren't around and put in what they want to. With Munch a Bunch Vending, you have complete control of what is available from our machines. If you'd rather us choose, we can survey your staff to see what they'd like. 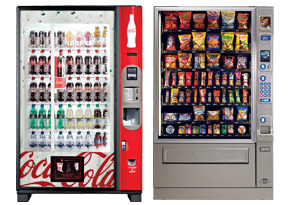 We offer traditional vending, subsidized vending and free vending options. If you qualify, you could also choose to have a Micro Market at your Carlsbad location. Our Micro Markets have a self checkout kiosk and can provide much more variety for your employees. Your account manager will come to your Carlsbad location and work with you to determine what you need so you aren't bothered with the details. Stop sending employees out to the store for supplies. We take care of everything. We also do plumbed in water filtration. Enjoy a fresh, crisp, clear cup of drinking water whenever you want. Since, it's plumbed in, so you'll never have a shortage of hot or cold filtered water. You'll notice the difference in your coffee and tea too! Phone us at 760-480-0870 or mabvending@yahoo.com. Get on board the Munch a Bunch Vending train and ride it to higher production and happier employees.